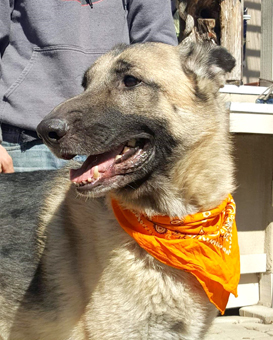 German Shepherd lovers will swoon at the elegant good looks of our magestic boy, Jack. 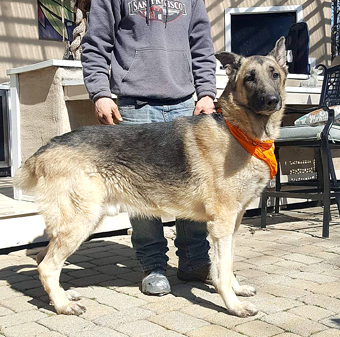 Our best guess is that Jack is an adult German Shepherd, about seven years old. He was surrendered by his owners to New York Animal Care Centers, where he experienced a reversal of fortune that left him uneasy and frightened. Thankfully, Jack was diverted from the euthanasia list and sent to us so that we could give him some space and TLC, to recover from shelter shock. It has been a joy, watching him warm up and evolve into a grand soul, who loves life. Jack loves people, and is generally friendly to strangers. 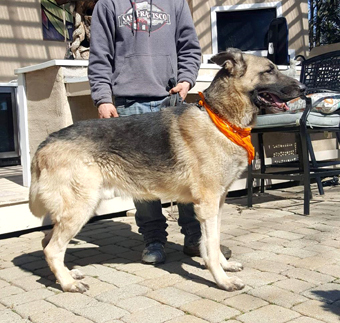 He would be the ideal K9 companion to an active single, couple, or family with older kids, who have large dog or Shepherd experience. 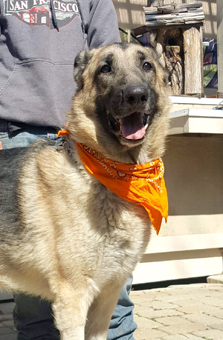 Powerful breeds like German Shepherds, that have a work ethic bred into their DNA, require purposeful lifestyles that challenge their mental and physical faculties. They also need a strong leader to teach them Canine Good Citizenship. 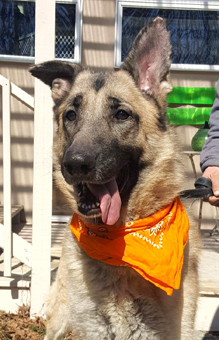 Jack is typical breed standard German Shepherd, in looks and temperament. He has the classic brown and black short coat with saddle bag markings. He is a large, strong dog, at a healthy weight of 95 pounds. He is a bit underweight, from his ramblin' days, and could easily carry another 10 pounds, but we'd rather keep him lean as he ages. He is on a high protein, grain free diet, with omega fats added to his diet for skin, coat, and heart health. Jack is an amazing dog, who exhibits the loyal, protective and extremely intelligent nature that is characteristic of the breed. 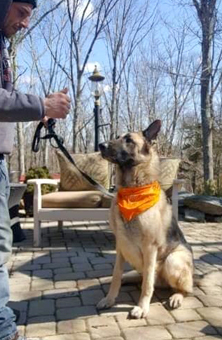 During his initial few weeks at the New York Shelter, Jack exhibited some reactivity to other dogs, while on leash, but we have found that he enjoys the companionship of other dogs, once he is introduced properly. We have worked on his basic obedience commands, and he seems thrilled to follow a positive training program. He now heels nicely and pays close attention to his handler, looking for direction. Jack loves the training regimen, and can easily move forward, in the hands of motivated adopters, to earn his Canine Good Citizenship certification, and beyond. Jack is in excellent health, and has been neutered. He has had full bloodwork, which was normal, and had a dental cleaning. He has been vaccinated for Rabies, Distemper, Hepatitus, Leptospirosis, Parvo, Parainfluenza, and Coronavirus. He has been dewormed, and has tested negative for heartworm, lyme, earlichia and anaplasmosis. If you are interested in Jack, please write to Denise, or call/text Denise at cell: 860-908-9738 for an adoption application.